Fast & economical bulk molecular weight analysisFor applications where a GPC method is known, a high throughput method can be developed to maximize efficiency and speed of analysis. 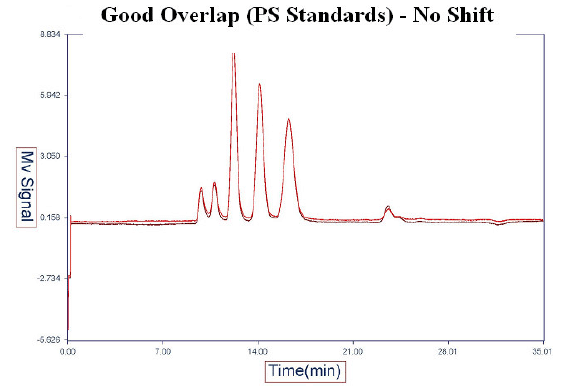 The optimized method which typically has a significantly reduced run time and provides the weight average molecular weight of the sample, or Mw, is called Flow Injection Polymer Analysis (FIPA). The shorter elution time of FIPA analysis is made possible by using a small porosity column. This causes all polymeric species to elute in a single peak while retaining small molecules. FIPA uses a light scattering detector along with a viscometer to determine the absolute weight average Mw, intrinsic viscosity and hydrodynamic radius of the polymer. For high volume quality control analyses, turn to FIPA for fast and precise Mw determinations!